The Banner Saga was never about happiness or making friends along the way—it was about survival, at all costs. The number of weary, miserable faces ready to stick a dagger in your back has only increased as the series rolled on, dwarfing the number of characters you could count on as genuine friends. Nowhere is this more evident than The Banner Saga 3, where everyone’s really tired and, for the most part, really pissed off. There’s nothing wrong with having everyone hate each other—you can’t really expect everyone to be overjoyed when reality itself is crumbling around them—but there has to be some give to this. MacReady’s line of “Nobody trusts anybody now, and we’re all very tired” in The Thing rings true for the characters of The Banner Saga 3, and it can all become a bit much when the hundredth character challenges one of your decisions that’ll have drastic consequences for the rest of the game. Picking up from the cliffhanger that The Banner Saga 2 ended on, the final chapter of the series is “The beginning of the end,” as the poet Aleo puts it. 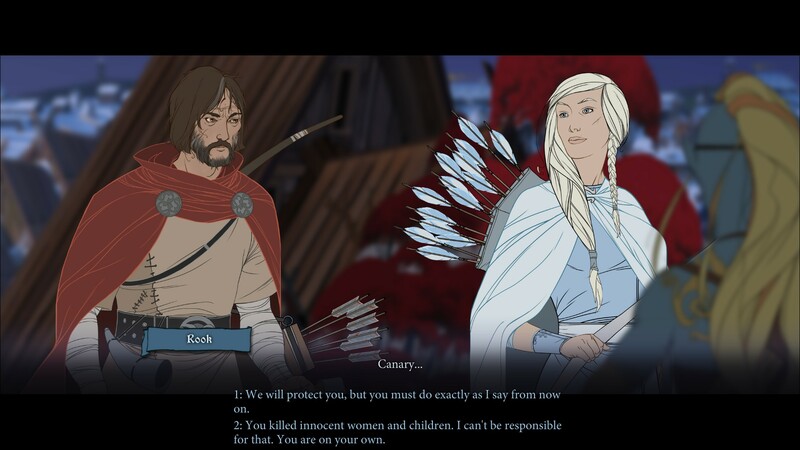 To describe The Banner Saga series as a ‘Viking conversation simulator’ would be selling it short, but conversations and crucial decisions form the main crux of the game. Between the conversations, there’s turn-based combat to be had—sometimes as a direct consequence of your choices—woven in between the story segments, as your characters move strategically across the battlefield, employing weapons and magic to hack away at their enemies turn after turn. When the combat gets going in The Banner Saga 3, it’s ruthless. Your selection of warriors is always outmatched by men or monsters and the turn-based battles feel largely hopeless. When an enemy hits home on a character, you feel it as your poor warrior staggers and stumbles around, struggling to stand upright and gripping onto their spear or staff for support. You’re not always forced into combat in The Banner Saga 3; rather your decisions often determine whether or not you can avoid a bloodthirsty battle by appeasing an unruly crowd with words alone. Speaking of decisions, they’re even more defining than your choices in the previous Banner Saga games. Whereas you felt the consequences of your choices further down the long, winding road in previous Banner Saga chapters, your choices in The Banner Saga 3 have instant ramifications. Half the characters we’ve spent the past two games with are now trapped in a city of death and destruction, with the endless horde of Dredge clawing at the gates and walls around them. Things are tense in the city of Aberrang, and one misstep can plunge everything into chaos. It’s actually pretty refreshing for the consequences of your actions to play out instantly, even if multiple lead characters can wind up dead over the course of 30 minutes. It doesn’t feel like there are a lot of “right” or “correct” choices for your characters in The Banner Saga 3, especially when they spend most of the game surrounded by rivals vying for control of Aberrang, that want nothing more than to see them dead. 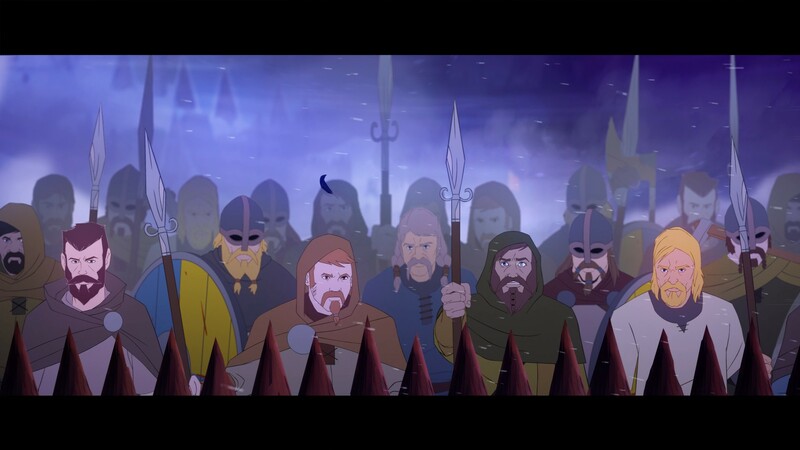 The Banner Saga 3 jumps around a little too much in the opening hours, with the story split between multiple protagonists who were separated at the climax of the previous game. There’s our motley crew in Aberrang, trying to keep the peace, while Valka leads a retinue on a suicide mission to try and end the destruction of the world, all while Zefr is off doing something of a magical nature, and (surprise!) Bolverk is back from the dead, and he’s trying to kill everyone. We jump from a hopeless situation in a city, to a hopeless situation on the other side of the world, and there’s nothing but dire straits for our characters whichever way they turn. On a mission to save the world that we’ve come to know over the past two Banner Saga games, one question begins to form: is this world even worth saving? Over the course of the three games, the characters we’ve journeyed with have faced horrors on the road—and that was before the world began to end in the third chapter of the series. Even three games deep into the series, the characters in The Banner Saga have never been properly fleshed out, and that's pretty disappointing. We’ve only seen a snapshot of their lives, when they’ve all got their backs against the wall, no less. Everyone’s miserable, and no one really likes each other, so why are we fighting so hard to save this world? Nowhere does this hit home more than in Aberrang, where instead of banding together, leaders of clans are still vying for control of the city, without a single thought for the horrors that await them outside the walls of the city. If this is the last stand of humanity, as it appears to be in The Banner Saga, then what’s even left? The characters of The Banner Saga series have always been a highlight, but I also feel like there’s so much about this world that I don’t know. We’ve seen our characters in a perpetual state of ‘fight or flight’ the entire series, barely pausing to catch their breath before hitting the road again. I don’t feel like I know these characters, which makes it all the more difficult to care about them when the entire world is collapsing in on itself. “Nobody trusts anybody now, and we’re all very tired” perfectly sums up this final entry in The Banner Saga series. Our fleeting time in this world has never been a happy one, and everyone is all the more weary at the end of it. We’ve had plenty of memorable moments with various characters along the way, but it’s in this entry that the entire journey falls into a bloody maelstrom, as the game steams full throttle towards its brutal conclusion with unfortunately barely a thought to spare for its characters. Tagged with Reviews,	The Banner Saga,	The Banner Saga 3. PODCAST | The well-regarded indie trilogy ends on a dark note.